Every weekend this year (more-or-less) I’ve gone to see the latest movie. This has worked fairly well so far; I’ve only had to subject myself to irredeemable awfulness on a handful of occasions. This weekend, I was really hoping that I would get to see The Spectacular Now, a movie that I’ve been hearing nothing but wonderful things about and would really love to see. However, I live in Salt Lake City where smaller independent films tend to just laugh as they casually pass us by on their way to anywhere else, only demeaning themselves to appear on Utah screens weeks later. So that left me with two options this week: The Smurfs 2 and 2 Guns. The Smurfs 2 wasn’t going to happen. Ever. I could think of a hundred other ways to spend a Thursday evening (the standard clichés of getting a root canal and watching paint dry are numbers 79 and 32 respectively). As for 2 Guns, I had no real desire to see it, especially as a substitute for a movie I am eagerly anticipating. Fortunately, there are two movies playing that I’ve been meaning to see but haven’t gotten around to. I took to Twitter and polled my followers, asking whether they would rather see a review of 2 Guns; The Way, Way Back; or Fruitvale Station. The Way, Way Back and Fruitvale Station were neck-and-neck in the polls, but Fruitvale had the more convenient show time, thus breaking the tie. 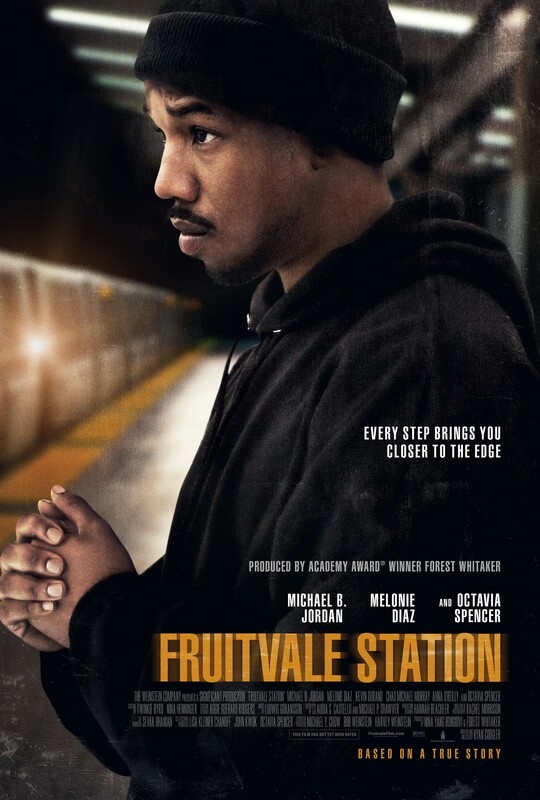 Fruitvale Station, – titled simply Fruitvale during its original run at Sundance – despite what you may have heard, is NOT about the shooting of Oscar Grant III by a Bay Area Rapid Transit police officer on the morning of January 1, 2009. That is part of the movie, true enough; in fact the film opens with footage of the actual event recorded on a cell phone camera. From there, though, the film jumps back 26 hours and allows us to live the last day of Oscar’s life alongside him. It’s about the life that the tragedy took away, not the tragedy itself. That’s the thing that makes Fruitvale Station work, and what separates it from so many other ham-handed “based on a true story” films. It feels absolutely sincere. It doesn’t try to portray Oscar Grant as a misunderstood paragon of human goodness; he’s actually kind of a screw-up. He went to jail for selling pot, he lost his grocery store job for missing work, and he recently cheated on his girlfriend. Oscar is a deeply flawed individual whose greatest ambition is simply to be better than he is right now. That ambition, though, is so essential to how we, as an audience, identify with Oscar. As individuals in the audience, we may or may not have sold drugs, we may or may not have been fired for poor attendance, we may or may not have been unfaithful to our partner, yet we all have failings, areas that we acknowledge we are screwing up in, and we all (hopefully) have ambitions to rise above those flaws and be better. Oscar isn’t a saint, but neither is he a villain – the film isn’t interested in such shallow and false descriptions – what Oscar is, is a person, with all the flaws and the foibles but also all the cares, heart, and capacity for good that are inherent in real people. Michael B. Jordan’s performance does a lot to further the goal of making Oscar feel like a real person. He creates a character that is rough around the edges, but has endless layers of warmth and depth just below the surface. Speaking of warmth, there’s a surprising amount of it in this movie; much of which comes directly from the chemistry between the players – both major and minor – in the film. Oscar and his girlfriend, Sophina, played wonderfully by Melonie Diaz, obviously care deeply about each other, as well as their young daughter, Tatiana. Oscar is also very close to his mother, Wanda, played by Octavia Spencer, and the way those characters interact feels very genuine. There’s a great scene near the midpoint of the film where all the characters gather together for dinner to celebrate Wanda’s birthday. You have Oscar’s extended family there, along with Sophina and Tatiana, and the love that the characters have for each other is palpable. There’s humor, heart, and warmth permeating this sequence, and it feels so comforting to spend time with these characters who all clearly care for each other. This story is a tragic one, but like all good tragedies the film understands that you need to give the audience something that they don’t want to see taken away. On that note, the film does not end with the shooting, but instead gives us time to hope, in vain, alongside Oscar’s family, and, eventually, time to grieve with them. By the end of the film there was not a dry eye in the (admittedly small) audience, but people weren’t crying over the injustice of a man wrongfully shot, or even the tragedy of a nameless life cut short; we were crying because Oscar’s future was taken away from him and from the people who loved him. The film is obviously a dramatization of true events, but it very rarely feels false or manipulative. There’s a difference between fudging facts to be more cinematic and fudging them to further an agenda, not that either is exactly wrong, but the former tends to feel more sincere. This movie features a handful of moments that come across as slightly too coincidental, but they’re all done for cinematic purposes rather than to push an agenda. In the end, this is a movie about a flawed individual trying to be better; it’s about a life cut short due to a tragic turn of events. In fact, the one area where the movie strikes a bad chord is during the standard white text over black screen epilogue that seems to be a requirement for films based on a true story. This is when the film abandons Oscar Grant, the man, and instead focusses on Oscar Grant, the symbol. I’ve always taken issue with this convention as it breaks one of the most fundamental rules of cinema – show don’t tell – but here it’s especially egregious. It’s not that I don’t agree with the statement being made, to the contrary, I very much support the message that the epilogue puts forward, however it is something that stands in direct opposition to the goals of the rest of the film. This is a film that aims to make us see Oscar Grant as more than just a faceless name in a tragic news story, more even then the symbol of a political and ethical movement, it aims to make us see him as a real person divorced from any of that, and to end the film on this note rings hollow. If a filmmaker does their job, and I think director Ryan Coogler most certainly did his job, a film like this should inspire the viewer to want to know more, it should lead them to seeking out more information, but when that information is just handed over in a words-on-the-screen epilogue it robs the film of its thematic statement as well as robbing an audience of the thirst to seek out this information for themselves. Despite a misstep that feels almost obligatory given the type of film being made, Fruitvale Station is a remarkable movie. It’s a powerful, moving, emotional experience, and it’s easily one of the best movies I’ve seen all year. I would encourage anyone reading this to seek out the film; if it’s not playing in your area keep an eye on Video on Demand services for its release. Ryan Coogler, in his first film, shows an astute understanding of the power of cinema and uses it to take a man whose name we may have heard and make us care about him as deeply as we would a friend. I’ve never met Oscar Grant, but I’ve spent a day in his life, I’ve laughed with him and his family, and I eventually mourned his death. If Mr. Coogler can accomplish all of that with his first film I eagerly look forward to seeing what he can do with his second.